"The fountain was the landmark. ‘Take left from the fountain …’, the instructions said." Generally reviews are written soon after one returns from the holiday. Here I am, writing this review after about six weeks. This is the time when the memory of the holiday is fading. The routine of the work and the home is in full speed. Looking from another angle, perhaps, this is the right time to revive the memory and relive the experience. We were in Italy from 3rd to 18th May 2014. Myself and my family lived in Capena. Our destination was Rome but we did not want to live in the city. For two reasons. One that it was touristy, and two, it was expensive. My third condition was that I wanted food cooked at home. My daughter is picky about food. So I researched far and wide with these three conditions in mind. That is how I came across Casa Marconi in Capena, an hour away from Rome and seeming to fulfill all my conditions. We arrived on a cold but sunny morning in Capena and asked for directions to Casa Marconi. We spoke English and the locals spoke only Italian. Language was indeed a problem in Capena. We made signs, we smiled and we got the directions. The fountain was the landmark. 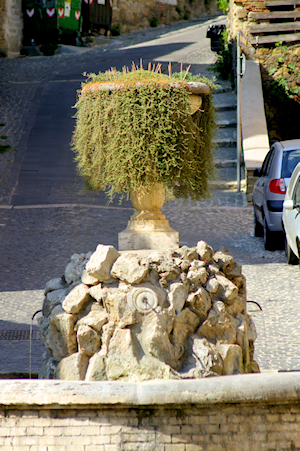 ‘Take left from the fountain …’, the instructions said. And we found the house in a narrow cobbled road. The house was beautiful. As beautiful as it was in the pictures in the website. My six-year old daughter ran up the stairs to find her bed beautifully made. She was excited about having her own bed. I eyed the kitchen platform, opened the drawers and found all that I needed to cook a simple meal. My husband, Sarath, longingly eyed the bottle of local red wine on the dining table. The book rack, in the bedroom and the living room, stocked books which included fiction and guide books. The chest of drawers and the almirah in the bedroom was roomy and smelled good. The bed was comfortable. The décor was minimal and elegant. For more than two days we did not stir out. We were content to live in Capena. 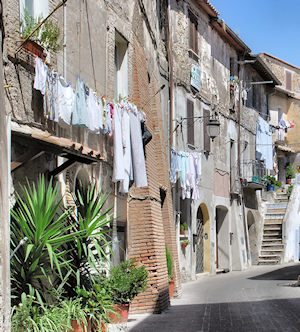 "In true Capena style, we dried our clothes on sunny days, in front of the main door of the house." I cooked all the fifteen days that we stayed in Capena. To our surprise, the kitchen stocked tea, coffee, spices, washing soap, drinking water, an assortment of crockery including wine glasses, coffee percolator, a French press, etc. I could see that some items belonged to the property and some others were left behind by the earlier guests. What was left behind gave a peculiar warmth to the kitchen. For clothes we were provided not just a washing machine but also clothes stands to dry them. So, in true Capena style, we dried our clothes on sunny days, in front of the main door of the house. We scrupulously followed the rules of disposing rubbish. One such morning, I was confused about why my green bin was emptied and not the black bin. I asked my neighbor. He barely understood me. And then, sometime later, he brought another neighbor who spoke English and solved my confusion. By the way, this neighbor had strawberries growing in a pot in his doorway. And, most importantly, we lived in the centre of the town. Cobbled roads, quaint houses and historical connections. But, it was not just history. Capena truly provided us with more than a glimpse of ordinary Italian life. Supermarkets, local vegetable shops, the Saturday market and the ubiquitous local café. 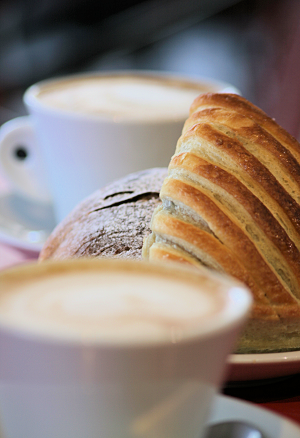 In the mornings, the cafés are bustling with the smell of coffees and cornettos. And, they open by 6 in the morning. You will often find a group of people, mostly men, sitting in front of the café, sunning themselves, smoking to glory and speaking most animatedly. Capena has a lovely park in the middle of the town. My daughter was in the park every day. Like all parks, this park also had mothers and children at all times of the day. On Sundays there is a bonus for children. The road adjacent to the park is blocked to traffic and huge rubber slides are erected. There is music and a couple of stalls selling children’s wares. The scene is that of shrieking children playing the giant rubber slide. We could not afford a car. We entirely depended on public transport. The bus stop is adjacent to the park. Rome could be reached in an hour’s time. Except that one had to strictly follow the bus timings. So, if you miss the bus, you can sit in the park. The region beyond Capena, in particular the roads to Morlupo and Farfa are most beautiful. Rolling meadows, fields and low lying hills. Juliet, thanks so much for making all this possible. We felt that we were living in a friend’s home. You have set such a standard of efficiency and care, that we feel spoilt, as we search for our next destination.